1. Preheat a fan forced oven to 180°C and line two oven trays with baking paper. 2. 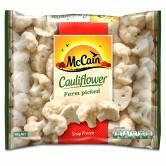 In a food processor rice the cooked McCain Cauliflower florets, it should be evenly chopped but not completely pulverised. Place the cauliflower rice into a tea towel and twist it to squeeze as much moisture as you can. The cauliflower rice needs to be dry, otherwise the breadsticks will be mushy. 3. Transfer the cauliflower rice to a mixing bowl, add egg, mozzarella, Italian herb seasoning, pepper, and mix well. 4. 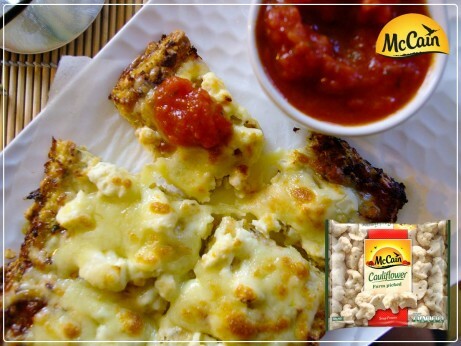 Divide the cauliflower mixture into two even portions and shape into a rectangular shape on the oven trays. Bake until loaves are set and starting to turn golden, about 25 to 30 minutes. Remove the loaves from the oven, sprinkle with cheese and return to the oven for 5 minutes or until the cheese is melted and golden in spots. Let cool a couple of minutes before cutting each into 12 evenly sized breadsticks. Serve hot or warm or cold, if you let it cool the crust will harden and it will be easy to hold. 1 Preheat a fan forced oven to 180°C and line two oven trays with baking paper. 2 In a food processor rice the cooked McCain Cauliflower florets, it should be evenly chopped but not completely pulverised. Place the cauliflower rice into a tea towel and twist it to squeeze as much moisture as you can. The cauliflower rice needs to be dry, otherwise the breadsticks will be mushy. 3 Transfer the cauliflower rice to a mixing bowl, add egg, mozzarella, Italian herb seasoning, pepper, and mix well. 4 Divide the cauliflower mixture into two even portions and shape into a rectangular shape on the oven trays. Bake until loaves are set and starting to turn golden, about 25 to 30 minutes. Remove the loaves from the oven, sprinkle with cheese and return to the oven for 5 minutes or until the cheese is melted and golden in spots. Let cool a couple of minutes before cutting each into 12 evenly sized breadsticks. Serve hot or warm or cold, if you let it cool the crust will harden and it will be easy to hold.